The DBoy BB Trap Device with Remote is the best way to cover an area without the risk of getting hit. This BB trap device propels BBs with a spring loaded trampoline. Once set into place it can be activated with the remote activator to cover an effective distance of +- 25 feet and 35 degrees. The BB trap can also be rigged to a trip wire so it goes off as soon as someone steps in front of it. 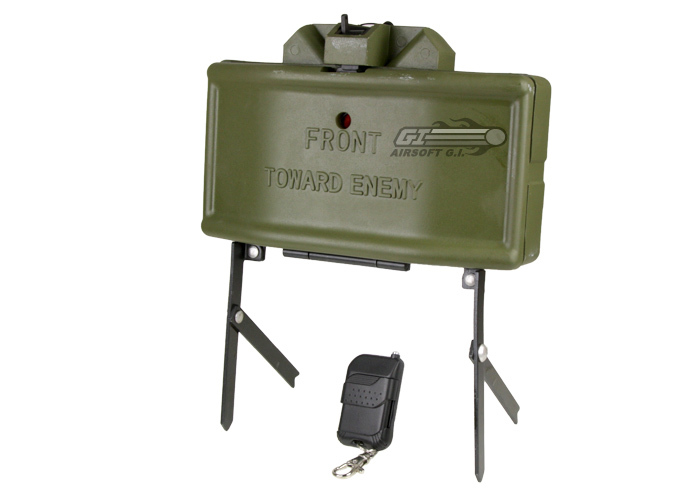 The bb trap comes complete with a remote switch and "dummy proof" instructions with picture illustrations and captions. There is also a wireless remote switch sold separately. Trip wire is the most effective way to set up the BB trap. Modification may be required to effectively use the remote switches. Professional tuning of BB trap can be done at Airsoft GI for an additional $20.00. Please refer to our additional labor surcharge. First off I have to say buying this from airsoft gi is the way to go. I currently own two of these and I bought the first one from another retailer and had to adjust not only the latch but also the mechanism that triggers the latch with the remote. When I unboxed my second one the packaging was already opened but that's because airsoft gi made sure everything was set properly. So if you're going to buy this get it here. Now that that's out of the way lets get into the specs. The plastic its made out of will survive normal wear and tear. The metal that the springs and the pouch is attached to will dig into the front plastic lid over time but not to the point of ruining the trap. It has about a 20 foot reach with a 5 foot spread on open terrain so the area of effect is really nice. The advantage to this trap instead of the other one is the remote is built in; however you don't have the ability to buy the laser tripwire system but as long as you get properly colored fishing line or string for your terrain a standard tripwire should be geed enough. Another thing worth noting is that if you do use a tripwire you should get everything set first, then remove the safety pin to reduce the risk of premature releases. Overall its a fun device that makes for an interesting addition to any airsoft game whether it be a back yard battle or a milsim event. Would be cool if you have patients (all the time in the world) to use this thing and have it work too. 9/10 times does not work as intended unless you want to eat BB's. Don't be fooled by the wireless remote, it doesn't work that way. This product was one that ive had my on for a while now. i purchased it after i recieved christmas money and upon receiving it i was overjoyed, this product is built really well with very dense plastic and solid metal core and legs. The legs are held on by rivets and mine came with a leg that fell off after first use. i have since fixed the problem with a few nuts and bolts. The remote was less than impressive with it barley working from 25 feet away, with a clear line of sight it functions way better. This mine takes a standard disposable 9V battery as is available at most grocery stores, etc. is it canadian legal ?